Finding one's voice, a familiar refrain of 1970s feminism, takes a new twist in recently published memoirs and movement histories. Casting a retrospective eye in order to gain a more expansive vision, Sara M. Evans begins the discussion in our special cluster of articles reassessing Second Wave feminism in the United States. Is our task, Evans asks, to weave a coherent history from the many strands and trends of this "massive, dynamic, thrilling, angry, and incredibly diverse movement"? The authors of the volumes she reviews wrestle with current stereotypes faulting "the" movement for its narrow preoccupations and for its many rifts and conflicts. 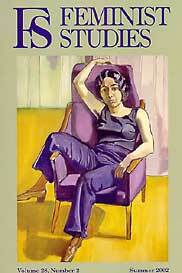 They do so by relating some of the fundamental questions of feminist radicalism to the broader context of Cold War international politics; by exploring questions of race, class, motherhood, and sexuality; and by examining the connections between various elements of women's liberation and other struggles and movements. While recalling moments of high drama and pivotal events in the early movement, the authors also come to new insights about its contributions, motivations, and limits by historicizing their own lives. The conversation continues in the three articles written by a new generation of feminist scholars who were not active participants in the early days of the movement. The articles by Premilla Nadasen, Anne M. Valk, and Becky Thompson take up in turn those sensitive issues and domains of contention flagged by Evans in her review. 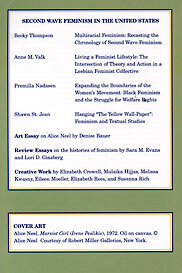 In "Expanding the Boundaries of the Women's Movement: Black Feminism and the Struggle for Welfare Rights," Nadasen discusses the unique brand of feminism developed by welfare rights activists in the late 1960s and early 1970s. Neither allied with feminist organizations of the time, nor self-identified as members of the Second Wave, activists fighting for welfare reform, particularly black women in the National Welfare Rights Organization, developed acute analyses of the relation between marriage as an institution and the patriarchal character of state welfare policies. This critique, Nadasen argues, grew out of the lives and struggles of poor black women. Although many of these activists did not self-consciously identify with the women's liberation movement, their grievances and political analyses must be counted within an expanded view of women's issues and contemporary feminist theory.